Our first concert of the season was held on Saturday, November 17, 2018 in the late afternoon and featured music appropriate to the Christmas season. This concert included El Romancero Gitano (Gypsy Songs) by Mario Castelnuovo-Tedesco, one of the foremost guitar composers in the twentieth century. 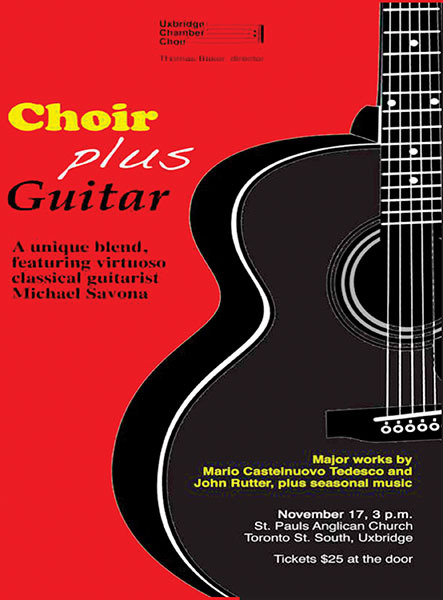 The choir was accompanied by Michael Savona, a nationally recognized guitarist. Our soloists included Don Wilmer, Maria Carabine, John Harder, Kevin Fullbrook, David Michel and Karen Morrow. John Rutter’s When Icicles Hang, featured texts from Elizabethan and other early English poetry, dealing with images from the wintery season and finally a selection of Seasonal Music. This piece was accompanied by Anne Mizen-Baker on the piano. Two instrumental pieces were performed to round out the program by both Michael Savona and Charmyn Clement. Our next concert is scheduled for Saturday, May 5, 2019. The major work for this concert will be Haydn’s ‘Lord Nelson Mass’ in line with the basic mandate of the Chamber Choir – to give opportunities for singers and audience to experience the greatest masterworks of the choral repertoire in a local context.